In order to create over 2000 jobs for veterans in the (cwt ) compensated work therapy/ transitional employment Program for the 169 VA facilities nationwide www.cwt.va.gov; this information is for the veteran friendly Employers who need to know about the public law 93– 112 where section 504 of the rehabilitation act of 1973. The law requires employers with 15 or more employees to provide qualified individuals with disabilities an equal Opportunity to benefit from the full range of employment and related opportunities that is available to others. The law prohibits discrimination for both male and female veterans in the recruiting, hiring, promotions, training, Pay, social activities and other privileges of employment. 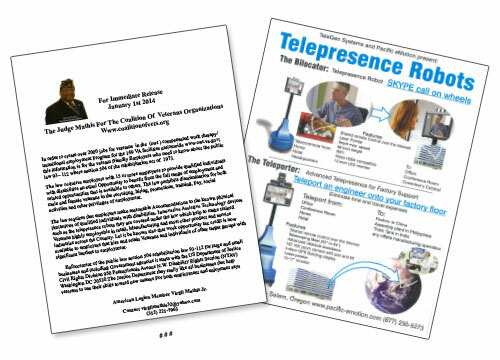 The law requires that employers make reasonable Accommodations to the known physical limitations of qualified individuals with disabilities, Innovative Assistive Technology devices such as the telepresence robots they are covered under the law which help to make trained Veterans highly employable in retail, Manufacturing and most other product and service industries across the Country. Let it be known also that work opportunity tax credit is now available to employers that hire and retain Veterans and individuals of other target groups with significant barriers to employment. American Legion Member Virgil Mathis Jr.